CarGurus has 33,695 nationwide Terrain listings starting at $4,495. It seems that smaller is better, at least according to the folks who make the 2015 GMC Terrain. This 5-passenger, once-midsize crossover is slated to cast aside the old Theta platform in favor of debuting here in the U.S. the presently international Delta2 (D2) underpinnings. This as yet ephemeral redesigned platform shrinks the new Terrain lineup by a couple of inches overall, as well as shaving a few pounds from its once hefty frame, and brings the stateside edition of this now almost-compact mini-ute in line with its non-U.S. kinfolk. Alas, this frame shrinkage may bode ill for those expecting a return of last year’s already paltry 63.9 cubic feet of cargo area, though there’s no official word that cargo space or passenger room will suffer. If nothing else, however, the expected downsizing should give this classy crossover (along with its Chevy Equinox cousin) some even more impressive mileage numbers. Also new for 2015, the Terrain SLT-1 and SLT-2 are slated to be delivered with GM's highly touted 4G LTE technology added to the standard OnStar Directions and Connections system. This upgrade is expected to offer WiFi hotspot connectivity, as well as the ability to support up to 7 separate devices. In any case and despite these rumored tweaks, 2015 Terrain trims are expected to remain the base SLE-1, the up-featured SLE-2, the penultimate SLT-1 and the top-shelf SLT-2. Front-wheel drive (FWD) should also remain standard for all trims, with snow-taming full-time all-wheel drive (AWD) again optional. Additionally, whisperings of a redesigned grille boasting some added chrome are also circulating around this crafty crossover, complementing hinted-at redesigned front and rear fascias, updated headlights and taillights, LED daytime running lights, upgraded interior accents, inserts and fabrics, and some tweaks to standard features and options packages. As it stands, though, and until fantasy is confirmed as fact, look for the 2015 Terrain to return with, depending on the trim chosen, 17- or 18-inch alloy wheels, a roof rack, full power accessories, cruise control, telescoping tilt-wheel steering and, of course the aforementioned OnStar Directions and Connections technology with new 4G LTE capabilities. The standard rear-view camera that debuted in 2014 should also return in all 2015 trims, as should an auto-dimming rear-view mirror. Again, depending on the trim selection, expect cloth or leather upholstery to adorn the upcoming Terrain’s traditionally elegant cabin, while front and rear air conditioning or, in higher trims, auto climate control, should return to keep everyone cool over the long haul. Entertainment-wise, look for the latest Terrain SLE-1 to once again sport a single-CD player with 6 speakers and satellite radio, while upper-echelon trims should return flaunting a premium 8-speaker Pioneer system. As well, GM’s Intellilink voice-activated audio interface should again make an appearance in all trims, with higher trims once more boasting upgraded smartphone apps and limited WiFi capabilities. The high-end SLT-2, meanwhile and barring any significant debuting enhancements, is expected to return with such extras as a standard power sunroof, a remote garage door opener, rear parking sensors, heated front seats, a power liftgate and memory for driver's settings. The tradition of lower trims remaining eligible for most of the fancier standard doodads found in higher trims as options should continue in 2015, while upper-level trims remain worthy of the available hard-drive-based navigation system, rear-seat DVD entertainment and upgraded and upsized wheels common to 2014 iterations. Despite the unconfirmed platform switch for 2015, the Terrain stable is expected to return packing the standard 182-hp 2.4-liter inline 4-cylinder (I4) powerplant of yore. Under the management of the ubiquitous 6-speed shiftable automatic transmission, this unheralded 4-banger should again put out 172 lb-ft of torque, while max towing figures remain pegged at 1,500 pounds. With the anticipated weight loss, hopes soar that mileage numbers will exceed the present 22 mpg city/32 highway in FWD trims and the 20/29 estimated in AWD versions. Need that heady V6 oomph instead? 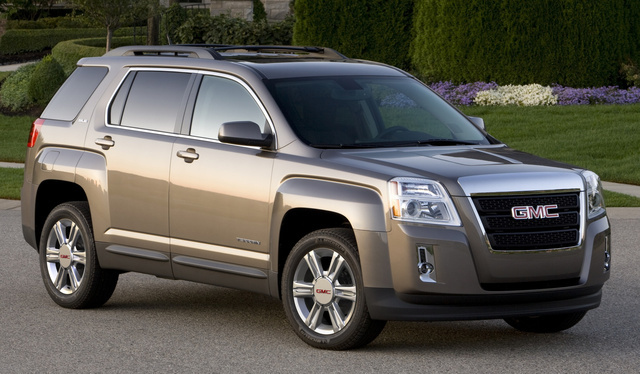 Look for the peppy 3.6-liter V6 engine to remain available to all 2015 Terrain iterations except the entry-level SLE-1. Mated with the 6-speed shiftable automatic, the V6 should again pound down 301 hp and 272 lb-ft of torque with towing figures bumped up to 3,500 pounds max. Also as a result of the whispered downsizing, mileage numbers for this larger engine are anticipated to improve from the current 17/24 in FWD variations and 16/23 in AWD editions. By the way, there have also been unverified reports of a 2.5-liter I4 powerplant in the works, as well as a hybrid Terrain, but whether GM’s talking the 2015 or 2016 editions (or ever) remains speculative. Oh, and both present engine offerings can be tweaked to burn E85 ethanol fuel for the green-leaning Flex Fuel (FFV) designation. Standard safety equipment, meantime, should include the usual mandated antilock braking system (ABS), traction and stability control, front and rear head airbags, and front side-mounted airbags, as well as front fog driving lights and those rumored LED daytime running lights. Also look for standard OnStar emergency services and stolen vehicle tracking to return, along with a post-collision safety system and a remote antitheft alarm throughout the Terrain lineup, with the SLT-2 again expected to tote the touted Safety Package with its forward-collision alert, lane-departure warnings and remote engine start as standard safety equipment. Said Safety Package, finally, is slated to remain optional for the SLE-2 and the SLT-1. What's your take on the 2015 GMC Terrain? GuruZ3J6T Was just wondering what size engin this car has. BamaPaul The vehicle we drove had a 4 cylinder which did not offer the acceleration, I feel, is need to enter a freeway. Once going, it performed well enough. Users ranked 2015 GMC Terrain against other cars which they drove/owned. Each ranking was based on 9 categories. Here is the summary of top rankings. Have you driven a 2015 GMC Terrain? 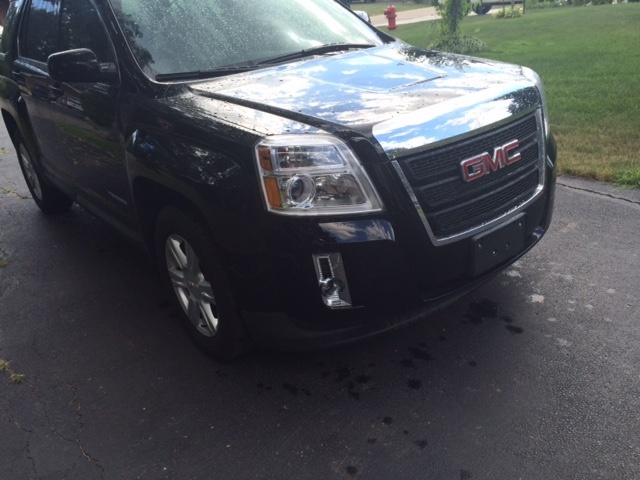 I have a 2015 GMC Terrain. Battery went dead. After I jump started it, the message center screen says LOCKED. Nothing works from screen including the radio. Any one know how I can reset it?